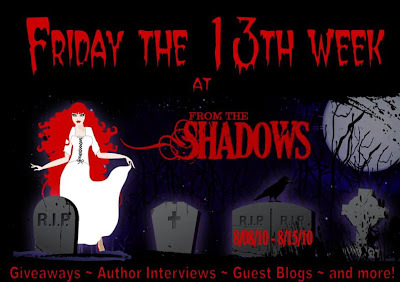 It is Day 3 of Friday the 13th Week at From the Shadows and I have 13 fabulous paranormal swag packs to give away! Swag packs will include bookmarks, postcards, posters and magnets. A few swag packs will also contain Clockwork Angel journals, however, these were damaged in transit so I apologize for any scuff marks on the covers. To enter my Friday the 13th Week Swag Giveaway please leave a comment on this post including your email address. US mailing addresses only. You do not have to be a follower to enter (though I always appreciate a follow!). Giveaway ends August 15th Midnight EST. Don't forget to enter my Friday the 13th Week Monster Giveaway. I am giving away 13 paranormal books! Click here to enter. I would like to thank Simon & Schuster and author Danielle D. Smith for contributing to this giveaway. I would love this, it is really nice of you. awesome swag! I can never find a bookmark so I am a little jealous of that stack you have. Thanks for hosting - everyone loves swag! The swag is awesome. I would love to be entered. I am a follower. Yay!! I am a new follower!I just love Friday the 13th! Its always a nice day for me! I got a great giveaway at my blog,come enter too! Great giveaway! I cannot wait for Clockwork Angel! Nice swag giveaway! I love swag. Great swag contest! I am a follower. I'd love to win! Clockwork Angel was awesome!!! Just wanted to say thank you for asking me to donate to the swag giveaway! Very nice swag. Thanks for the giveaway. Thanks, I'm a new follower. Great giveaway and awesome swag! Thanks!